What the hell is with McGuinty and all of this nanny state nonsense? Banning teens from tanning beds? Really? Isn’t this the job of a parent? This move is totally unnecessary. Ontario is preparing legislation to ban the use of tanning beds by people under the age of 18. Premier Dalton McGuinty says the Liberal government will adopt a private members’ bill by New Democrat France Gelinas to restrict the use of tanning beds to adults. McGuinty says the government needs to act on the best scientific evidence that shows tanning beds pose a high risk of cancer for young people. Come on! Does Ottawa Public Health have a direct line to the Leader of the OLP? This is a ludicrous waste of tax dollars and will be difficult if not impossible to enforce. I never have been one to jump on a new model of a gadget just “because”… and you can bet I won’t be giving into this craze either. Though millions will. Peter Lougheed was a great Canadian and we should remember his contributions to the country. That is all. I am disturbed and upset by the recent events in Libya. While I do not condone the film that, allegedly, sparked the new anti-American violence )I say “allegedly” because I kinda believe that the murderers of the American Ambassador and the other rioters were just looking for an excuse to get themselves into an anti-US slather in any case. Again, if I have not yet been clear enough – I am going to be SO pissed if there is another NHL lockout! Epic proportions of pissoffedness! At least I have Arsenal – footballers DON’T strike and football team owners DON’T lock players out! Gunshots – 2 nights this week. In my neighbourhood. So not cool. increased revenues to provincial/territorial and federal orders of government in the range of $1.2 to $2.7 billion. The Association of Municipalities of Ontario estimates an infrastructure gap of at least $60 billion that will take 10 years to close, leaving municipal governments with a bill of $6 billion each year. Almost half of this gap exists within road and bridge infrastructure, with the remaining amounts occurring in other core infrastructure categories such as drinking water, wastewater, storm water, public transit and solid waste. Ottawa’s municipal infrastructure assets are valued at $32 billion. 20% of Ottawa’s roads are between 20 to 40 years old, and 15% are more than 40 years old. 30% of City facilities are over 40 years old, and 40% are between 20 and 40 years old. 27% of Ottawa’s piped infrastructure is over 40 years of age; 50% is between 20 and 40 years old. In short, there is a HUGE infrastructure deficit that is starting to catch up with cash-strapped municipalities. The 174 sinkhole is just one example, as was last year’s water main issue in the south end. Investment and innovative thinking is needed, folks. Maybe more P3’s will address some of the problems. But definitely some outside the box thinking is going to be needed by our leaders at all levels of government. And soon! Conservatives! They sometimes can’t spell the name of the riding that they are representing! 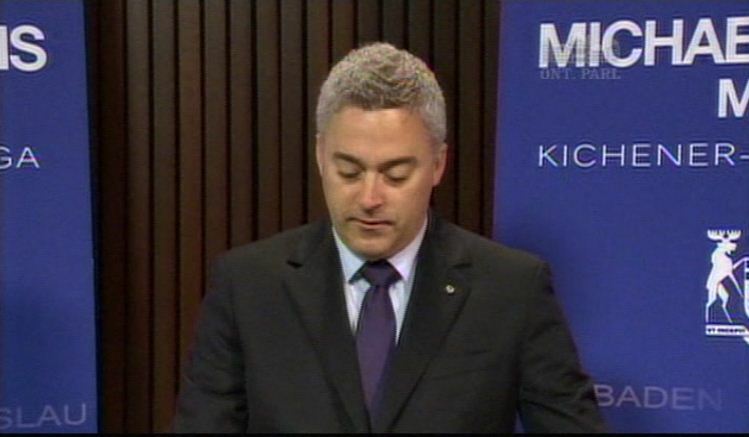 Case in point: Kitchener-Conestoga MPP, Michael Harris. h/t to Warren Kinsella for pointing this out and giving me a laugh this morning!